Today, I got pushed from yet another calendar. It was the third time in a week it’d happened. It came after an “all lines are busy, please try your call again” type response from someone else when I asked if we could get together sometime soon. They weren’t even going to check their calendar for a spot. I was supposed to follow up. I finally had to realize a hard truth – I’m only being penciled in. I am a spaceholder that gets weighed against other opportunities or priorities. And it doesn’t feel very good. I was reading the news today of Anthony Bourdain’s suicide on the heels of Kate Spade’s. I think we all think about these people as being on the top of the world where happiness and bliss are served up daily. And maybe they are but maybe days are also filled with disappointment and sadness and not feeling valued. Your value and worth isn’t determined by others but it certainly weighs into it. It’s fine to feel confident and comfortable in your own skin but when you start to realize people mean more to you than you think, rightly or wrongly, you mean to them, you can start to unravel. I get how that happens.There’s nothing worse than feeling like you don’t matter. Here’s the thing – I love people. I love connecting with people. I love talking about the little things. I love talking about the big things. I love sharing joy. I love sharing heartbreak. I feel energized when I am with people. They are my priority because, and here’s the hard truth, our time with each other is fleeting. My parents were my people. They scrubbed everything on their calendar when given the opportunity to see me. Travel plans were cancelled. Dinner dates forgotten. Nothing was more important than our time together. And I looked forward to it just as much. I relished our time together and recognized that those moments would be memories some day. Memories I could cherish. My parents are now long gone but all those moments spent, are still here because we made time with each other the priority. I’ll never regret shelving any plan to spend time with my people. Every year I make a list of goals in different categories – focus areas. I have a note card for finance, travel, fitness, etc… and one for friendships. I go through my friends list and see who I haven’t seen in a while. Who I need to reconnect with. Who makes me happy. Then I put them on the list and, hopefully, on the calendar. I reach out. I’m often relentless about nailing down a date and when I get one, it becomes something I eagerly anticipate. Several times leading up to a date, I get excited just thinking about it – imagining conversations we’ll have, scouring recent FB posts so I am conscientious about what’s going on – making sure I haven’t forgotten a birthday, a child’s graduation, an anniversary of a parent’s death or some other major milestone. I think about what we connect on and what we’ll talk about. I get almost giddy. And then I get the text that something has come up and they need to reschedule. I get it. Things DO come up. Bosses spring surprise meetings on you. Other meetings get moved. Cars break down. Whatever but I still find it rather soul crushing. Anticipation and disappointment are not things I do well. It is easier when we immediately find a new date and I have a built-in date to anticipate again. More often than not, however, the ball is left in my court. The impetus is left on me to find the new date and try and set something up even though I have the most flexible of schedules. Since I get so much out of time with friends, I usually eagerly find new dates but with this new revelation, I wonder if I should. Should I? Would you? At what point to you stop chasing someone? Now that you have had time to think about it – who pencils you in? Who, when they add you to their calendar, selects “Show as Free” instead of “Show as Busy” for your appointment? Who never misses a hair appointment but often “has to reschedule” you? The results are sometimes shocking, aren’t they? Let me just say that I’m not innocent. I cancel things too but I weigh things out. I was supposed to go to a retreat with friends a few years ago and was really looking forward to it but then finances creeped in and other opportunities arose and I systematically went through the list of friends I wouldn’t get to see. I made charts and tables of who I could see at other times and in other places and who was going to be too big of a missed moment. 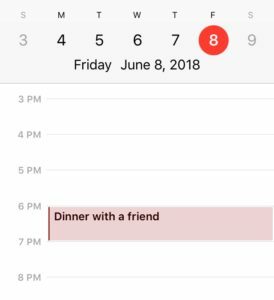 It wasn’t until I had a good plan for making up for this missed time together that I confirmed that I wasn’t attending. And it wasn’t until later that some people told me that they had thought about canceling their trip too but hadn’t because I was going to be there. That surprised me but then this is a group of people where I never have to question whether I matter or not. I’m penned in. I’m bold-typed. I’m marked top priority. They’re my tribe and they never leave me feeling less than. So now that you have this information, what do you do with it? Do you wipe away the tears of disappointment and try again or do you ask the other person to find a date and, no matter how bad YOU want to get together, wait for the call or text to come with dates? I’m still trying to figure that out for myself. I’ll let you know how it goes.